Text-only versions refer to pages without images or graphics, and often with single-column layout, little or no color, and simplified navigation interaction. 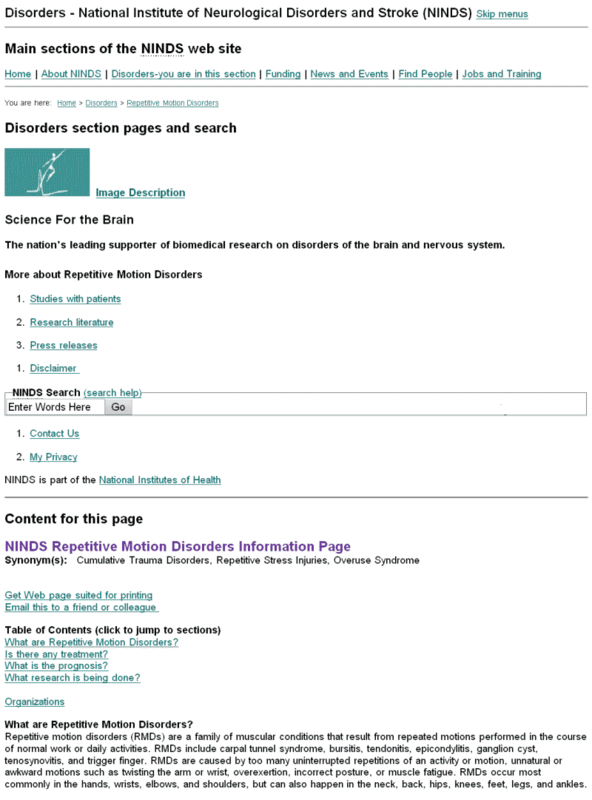 Figure 1-17 shows a main site page (National Institute of Neurological Disorders and Stroke, NINDS, www.ninds.nih.gov/disorders/repetitive_motion/repetitive_motion.htm), and Figure 1-18 is the text-only version of the same page. Text-only versions should have disappeared long ago, but unfortunately, they are still around. Text-only versions are not adequate accessibility solutions for several reasons. Most text-only versions are not accessible for some people with disabilities. In Figure 1-17, the navigation in the main site is easy to distinguish because of the design and colors. The navigation is difficult to distinguish in the text-only version in Figure 1-18. People with some types of cognitive disabilities would not be able to use this text-only version because they couldn't differentiate the navigation from the content. Separate versions are rarely fully equivalent and often outdated. When there are two versions of a website, invariably, the text-only version doesn't get updated as frequently as the main version. Even when organizations and individuals have the best intentions of keeping two versions in sync, the realities of deadlines and limited resources interfere. Some tools generate both a main version and a text-only version from a single source of content, supposedly eliminating the problem of separate versions not being in sync. Other tools facilitate creating a text-only version of an existing site. Despite claims that these tools provide totally equivalent versions, I have yet to see it. In one such implementation that I reviewed, the text-only version was fairly close in content with the main site; however, the text-only version was missing promotional material. Therefore, users of the text-only version missed out on special offers available through the website. This was not only not equivalent, but in this case, it also was discriminatory. The main version often lacks even the most basic accessibility. When organizations develop text-only versions, they usually spend little effort to make the main site accessible. Many people with disabilities can use websites with only minor adjustments. For example, take the case of a person who has low vision where she can read text that is just a little larger than what most sites use by default. She doesn't need screen magnification software (which is costly), and instead just increases the text size through browser settings. Providing basic accessibility in the main site allows her and others like her to use it, rather than forcing them to use text-only versions that are usually much more difficult for sighted people to use, as demonstrated in Figure 1-18. Also, people who regularly use the main site may sometimes have accessibility issues from temporary disability or situation limitation (for example, they break their arm, break their glasses, or break their mouse). If the main site is inaccessible, they would be forced to use the text-only version that looks and acts very differently from the one they are used to using. Clearly, text-only versions are not an acceptable substitute for making the main version of your site accessible. There are rarely good reasons to provide a text-only version. That's not to say that you should never provide a text-only version. If the main site is fully accessible and the text-only version is fully equivalent, then it's acceptable. It would be wise to clarify that, lest people see the text-only version and assume that you're using it as a cop-out for making the main site accessible.